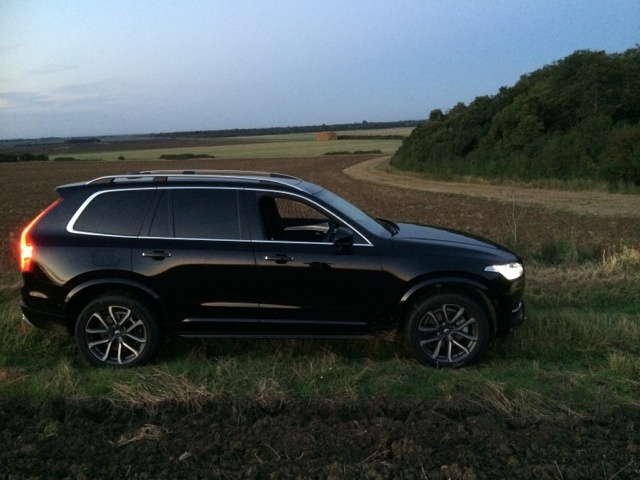 This road test was undertaken with a view to providing a typical member of BASC with an insight as to the suitability, desirability and practicality of this high spec Volvo XC. The XC90 is a big car, with great presence and imposing lines, standing ‘head and shoulders’ above other ‘normal’ vehicles around it but of course it has to be, it will carry seven people and a significant amount of luggage. As my old flying instructor used to tell me, stand back and look at it to see if it looks right before you get up close and it does look right! The tested model arrived in shiny black and it certainly wouldn’t look out of place dropping off dignitaries at 10 Downing Street! It may however, look a little out of place in the farm yard until it has been ‘de-shined’. The big, road based tyres, low and wide didn’t look like the tyres that would take it on a serious cross country journey and I think that many BASC members, like me, would certainly want to switch these out for something a little higher profile and with a rather more rugged tread pattern. I intended to try it way off road but as we’re still in first impression mode, this vehicle appears to just lack a little ground clearance for the farm and cross country application. It was also lacking another countryside accessory, a tow hitch, which is likely to be another BASC member requirement, I would have liked to test it as a tow vehicle, I suspect it would be good and may well find favour with the caravanning fraternity, IF that 2 litre engine can deliver the power necessary and on paper is says it will, time to find out! Getting to know the Beast. Time to enter the parlour! A quick press on the ‘unlock’ button on the keyless fob, has the lights flashing and the neatly folded door mirrors swinging into position, the doors are illuminated for easy location and entry in any light conditions. If you’re heading towards the car loaded with shopping, opening the tail gate doesn’t require a lot of effort either, a press of the button on the key fob or even a quick kicking motion under the rear bumper has the ample tail gate swing open. A convenient button on the base of the open tail gate, now nearly 7 feet in the air, reverses the ‘open sesame’ trick and is a bit of a stretch for some of our shorter family members and perhaps a button a little lower down may be worthy of consideration, maybe near one of the rear light clusters. It is quite a step up into the driver’s and front passenger seat, I would want to see a convenient grab handle appear in the door frame when the door is open and fold away again as the door closes, so as not to provide a protrusion to injure occupants in the event of a sudden deceleration or worse, in the event of an accident, I’m sure Volvo could come up with such a device in a 50 grand car. If the car is on any kind of side slope, the big solid and heavy front doors need quite a bit of opening and closing respectively, several times I had to push the door ‘uphill’ to get out on a slope only to have it fall back on my legs as I swung out and that is a big heavy door to have close on you. The third row of seats, the 2 rearmost seats for children, for this is the only size of occupant who can really be accommodated here, really needs some agility to gain access. No matter how we slid and folded the middle row seats, it was still essential to provide some assistance with a huge step or gentle lift for a small person. I feel a little extra work on gaining access to the third row would be well worth the investment, perhaps an extra step or similar. The seats are very comfortable and it is impossible to conceive that anyone could not get comfortable in these well-appointed and infinitely variable leather arm chairs, this is going to make any journey comfortable, they adjust every which way and will even warm your rear if you so desire. I could write ‘war and peace’ on the gadget list but suffice to say that I have flown aeroplanes with a lot less gadgets and one could play for hours if gadgets are your thing. Gadgets are not my thing but safety certainly is and I loved the safety features, of which more later. The gadget box contained voice activation for climate and entertainment control and a whole host of other things but for me, navigation and safety devices outweigh the value of other ‘options’ by a mile. The view from the driving seat creates the immediate impression that the big Volvo isn’t so daunting after all. Visibility is excellent, mirrors and driving aids all help to make it an easy drive, despite its size. With the keyless fob in the vehicle, all you need to do is turn the start / stop switch to start and the horses are awake. It is a beautifully quiet and smooth for a 4 cylinder engine, the vibration and sound deadening is of a very high order and if you didn’t know it was a 4 you could easily believe you were sitting behind a 6 cylinder engine. Very powerful and smooth power delivery through the lovely 8 speed automatic gearbox, it would have been my first choice of power and transmission combination and it didn’t disappoint in any situation, gravel, grass or tarmac. Between the beautifully weighted power steering and that gear box, travelling was not going to be a chore! We covered 873 miles on every possible kind of journey that the vehicle is capable of during which the car returned an average of 41 MPG, which was well down on book value, as we have come to expect for almost every vehicle. The very efficient start stop technology was the best and most consistent I have ever used but even this didn’t pull the mpg up to where it should be. Journeys included the daily commute to work, which is mixed country lanes and A roads in to the edge of the town. We had motorway journeys from Cambridgeshire to visit family in Staffordshire including the M6 and other A roads. We took Children and Grandchildren on days out and to Church on Sunday. I also drove it to and through the farm to collect wildlife cameras and deliver essential equipment for an executive training course at the wilderness camp site and I even shot a couple of rabbits from the driver’s window! Acceleration is rapid once it gets off the mark but there is a slight lag between pressing the go pedal and leaving the mark, I couldn’t detect if this was a gear choosing process or what but when it had decided how it was going to launch, it certainly did go! Accelerating to cruise speed or speed matching with other traffic in the blink of an eye. I loved the safety features and all those aids that assist with situational awareness. I have encountered some of them before but never so many on a single vehicle. In order of preference, I love the blind spot warning lights in the door mirrors, they were great on the motorway and as a look over the shoulder is pretty worthless because of the width of the door pillar, I quickly got to love them! Next the adaptive cruise control is brilliant on the motorway along with the proximity warning lights which all aid awareness of a tired driver and keep those fast moving traffic jams just far enough apart to prevent using the car in front as a brake! Reversing Camera is also brilliant, with proximity warnings on all corners, it really does help put this big car safely into modest amounts of space, it will even park itself but I didn’t have to opportunity to test that, everything else worked beautifully so I have no doubt that this would too. For a big, tall vehicle, it drives superbly well and is not hard work at all, there was no hint of body role despite the slightly higher centre of gravity than your average saloon. It drives like a limousine and you could certainly use it for the school run, collecting the Chief Executive from the airport or taking a spare part across the field to the combine harvester and it will do them all very well. The big Volvo just ate up the miles on a late evening motorway journey, it was comfortable, restful, navigation was a breeze, adaptive cruise control, mirrors and safety features to assist in avoiding the increasing number of drivers who have forgotten what mirrors are for or just thought they bought the road with the car! We arrived home swiftly and safely, 2 awake and 2 asleep and I didn’t feel exhausted. I did detect a constant roar from behind me which I assumed was road noise but as the seats were so comfortable, I couldn’t find any volunteers to lay on the floor to confirm or deny my suspicion. If I was right, then that is a disappointment as the sound deadening from the engine and front wheels is superb maintaining the impression of a being in a six cylinder limousine, so logic dictates that it could be done for the rear wheels too. During the period of the test, we had barely a drop of rain and so when I took the Volvo off road, it was on rough and grassy tracks but no mud to speak of and by choosing my line carefully the road tyres and the ground clearance proved adequate but in a month or two when it’s been wet for a while, I’m not sure if it would fare quite so well. 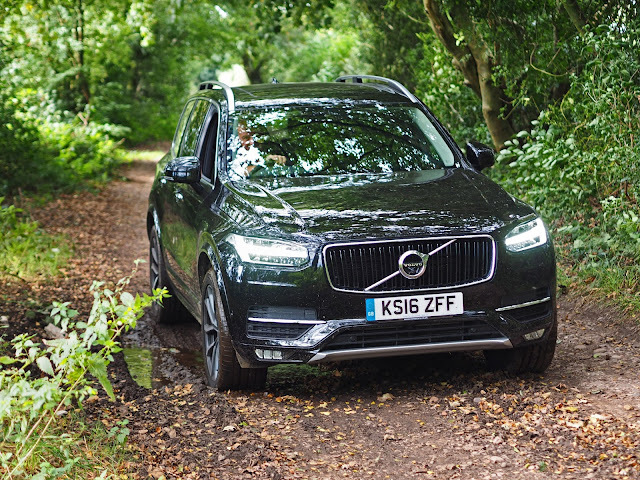 If you have a £50k plus budget for a luxury estate which you need to do almost everything, then the XC90 could well be the one for you. It did everything I asked of it, which is probably more than many of its owners will. I know several XC90 owners of older models who fill all the seats, do the school run and longer trips on holiday but if their tyres touch grass it’s because someone spilt grass trimmings at the city recycle centre! 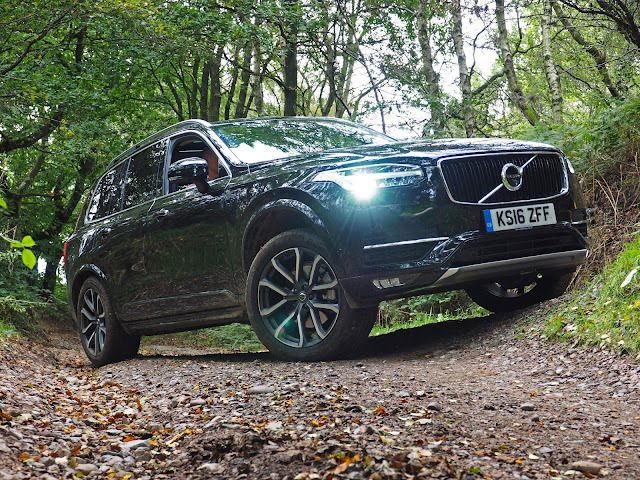 I think of the XC90 as a gentleman’s carriage rather than a workhorse, a very capable one too. 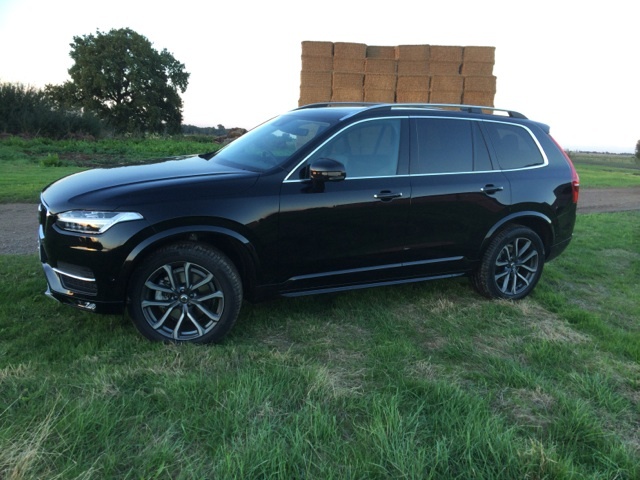 I think for many farm / shoot applications, the XC90 may just be a little too grand and to excel in that role it needs just a little more ground clearance and some more XC type tyres, the road biased tyres on the model I tested were not going to go far when the mud got serious or even if the grass was really wet. If you want to do the airport run for someone special, take 4 big adults (and the driver) for a special night out or take a picnic for 7 (so long as 2 are children) off the beaten track or a major camping adventure, the XC90 will certainly do it all and then some. Definitely test drive it, it’s a big step up for small people and definitely needs a step to assist those entering into the back row or for those lifting children in to the back row. It did take me by surprise with one little party trick, as I hit a particularly large pothole on the undulating fen roads, the seat belt pre-tensioner activated and took all the slack out of my seat belt and then about an extra two trouser sizes! Wow! That got may attention but it was reassuring to know that if I hit something, the seatbelts would be tight! Loved the Big Volvo, smooth, powerful, quiet in the front and drives like a limo, love the seating position, the visibility and driving and safety aids. Tyre choice wouldn’t have been mine and a little more ground clearance would be a boon when the going gets tough, it’s a little bit thirsty considering the motorway miles we covered and I would have loved to tow a trailer for a few hundred miles to test that particular capability. Would I own one, yes absolutely!